An usually fit and active eight-year-old, Anna Crofton rarely came down with anything more serious than a minor cold. So her mum Isobel wasn’t too concerned a few months ago when Anna showed her a small rash on her groin. “It first appeared to be a small rash on the inside fold between her groin and leg, and it was itchy and a bit uncomfortable. I thought it was either eczema or ringworm,” recalls Isobel, a piano teacher from London. But when Isobel took Anna to the GP two days later, the itchy rash looked a bit different. It looked like a series of small, fluid-filled blisters or pustules on the left side of her groin, and the doctor was mystified. Isobel took her daughter home, and waited for a phone call from the GP, who had shown the rash to another consultant at the practice and was waiting to have a discussion about what it would be. Then the doctor called and said it was shingles. Because shingles in children is rare, many doctors do not recognise it when they see it. In fact, it is often misdiagnosed - amongst the medical profession and parents - as impetigo or an allergy. Is is estimated that about 20 per cent of all adults will come down with shingles in their lifetime, but even then the condition is often misdiagnosed amongst adults as well. Along with the rash and pain, sufferers can also have enlarged lymph nodes and feel a general fatigue. “I was quite shocked when the doctor rang me with the diagnosis, as I thought only adults got shingles,” Isobel said. “They told me it was rare, but that it does happen with children – but only if they contract chicken pox before the age of six months. Shingles is almost always an adult illness, one that more often than not appears on adults aged 50-plus. It is caused by the varicella-zoster virus, which is the same one that causes chicken pox. Only people who have already had chicken pox can get shingles. Shingles is really a slightly different occurrence of the chicken pox virus, which in most sufferers has lain dormant in their body for literally decades. It often appears at times of deep stress, when the body is run down. 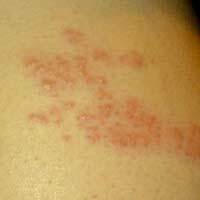 In adults, shingles can be very serious, as it is often extremely painful and uncomfortable. For some reason it occurs on one side of the face or the body, usually in the form of small blisters that are filled with fluid. People who have had the chicken pox vaccine can also come down with shingles, as the virus can lie dormant within them from the jab. Shingles is usually uncomfortable and unpleasant, but not dangerous. It can be dangerous, however, for those whose immune systems are compromised from HIV or chemotherapy, for example, and for pregnant women. Although you cannot catch shingles, people who have not had chicken pox before can catch the illness from someone with shingles. In rare cases, people who experience shingles get something called post-herpetic neuralgia, even after the initial infection has gone. It can make the nerve endings in the affected area extremely painful to touch, and can last for up to a year. It’s still unclear why some people get post-herpetic neuralgia and others don’t. If you are over age 70 when you get shingles or if it is very widespread or painful, then you are more likely to get post-herpetic neuralgia. The Zostavax vaccine is now available to people aged 60 and over to prevent them from coming down with shingles and post-herpetic neuralgia, but the vaccine has not yet been used on children. Shingles is rare in small children, and those who get it under age 10 usually have very mild symptoms, compared to adults. Children have a greater chance of developing shingles if they caught chicken pox early, or if their mum came down with chicken pox in her third trimester. While Isobel was initially frightened when she learned of her daughter’s diagnosis, her fears came to nothing. “At the end of the day, it was a real non-event, a small rash on her hip that disappeared after a week or ten days which was a bit itchy,” she says. “The doctor didn't even prescribe any medication. It was even less of an illness than chickenpox.